GreenWorks is the exclusive brand owned by manufacturer Globe Tools Group. It has an operating headquarters in North Carolina, USA, but the manufacturing facilities are in China. GreenWorks produce an extensive range of outdoor garden equipment and power tools. All of its products are electric, meaning the entire company range releases zero emissions. All products of varying models are also backed by a 2 year warranty. GreenWorks are known in the public eye as a company that cares about the environment. With no gas products, they are able to reduce their own footprint and those of their customers. GreenWorks has produced five models of chainsaws to suit various markets. From homeowners to professionals, you are sure to find an electric chainsaw to suit your various requirements. Aside from offering a full range, GreenWorks models are also very affordable and can be found for sale in many retail stores and online as well. It can make up to 150 cuts on a single charge. The battery is interchangeable with other GreenWorks power tools. It has 70% less noise and vibration. Some users note battery life is poor in comparison to other models. It can get clogged easily. 16 inch bar and chain. G-MAX 40V Li-Ion battery and charger. Dimensions: 31 x 9 x 8.5 inches. AIt can produce approximately 150 cuts to one charge. QHow long does it take to charge the battery? AFor the 4aH battery, around 2 hours. QAre the batteries interchangeable with other GreenWorks products? QWhat kind of bar and chain does it have? This GreenWorks battery powered chainsaw more than meets the mark when it comes to reliability and power. Although not a commercial grade or professional saw, it has everything a homeowner needs to get general yard maintenance completed. It’s quiet, lightweight, and requires minimal maintenance. It also starts with the push of a button, effortlessly, every time. It comes with a charger and battery – both of which are under warranty. It can also complete up to 150 cuts on one charge, and the battery only takes two hours to recharge. For the homeowner with minimal maintenance, it’s one of the best GreenWorks chainsaws for the money. Check out what other people who purchased this product think about it. Read GreenWorks 20312 cordless electric chainsaw reviews. It has a good size 9 amp motor for those light jobs around the home. It has an auto-oiler for user convenience. It starts with the push of a button. The chain comes off easily. It leaks bar oil so you need to drain it before storing. Some components don’t appear to be well made, according to reviews. 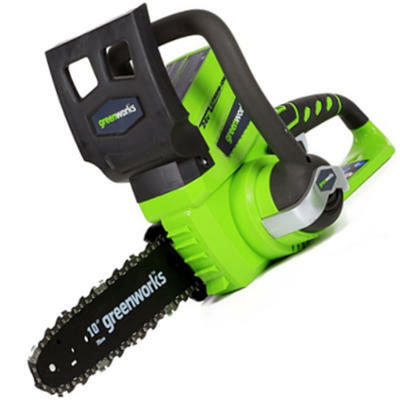 GreenWorks electric powered corded chainsaw. 14 inch bar and chain. Dimensions: 29 x 9 x 7 inches. QCan the auto-oiler be adjusted? QHow many amps does the engine deliver? QWhat replacement chain does it take? AOregon chain, 52 links, pitch is 3/8″ and gauge .50. For the less experienced and those with minimal cutting requirements, this GreenWorks saw is perfect. With a 14 inch bar, it has the cutting power to undertake light work, and requires no maintenance. It has an auto-oiler, a 9 amp engine, and all it requires is a power source. It’s also a very light, quiet and easy-to-use saw which will benefit many home owners. It’s affordable, and is available for sale both online and in hardware stores. Check out what other people who purchased this product think about it. Read GreenWorks 20222 corded electric chainsaw reviews. It can complete up to 150 cuts with fully charged 2AH battery. It has the same power as a 45cc gas engine. It has good safety features such as an electronic chain brake. The chain can fall off easily. You can’t take it too far from a power source for the battery. GreenWorks Pro battery powered chainsaw. 80V 2ah li-ion battery and charger. 18 inch bar and chain. Dimensions: 7.56 x 9.65 x 32.4 inches. QWhat chain does it use? AOregon low profile chain, 91P062X. QWhat battery comes with it? A30 minutes to an hour. 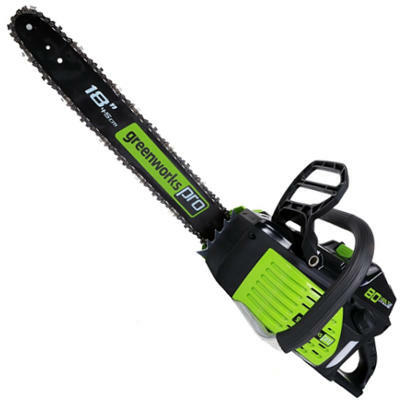 This chainsaw is one of the best GreenWorks chainsaws for the money. Many people have been singing the praises of this exceptionally powerful electric powered chainsaw. Not only is it on-par in power with a gas powered chainsaw, but it’s so easy to maintain and starts at the push of a button. The battery lasts for up to 150 cuts (if you’re cutting 4×4 pine), and it’s also very quiet and lightweight. There’s everything to love about this chainsaw and it could almost be used as a commercial grade saw, or as a professional’s back-up saw. Check out what other people who purchased this product think about it. Read GreenWorks Pro GCS80420 cordless electric chainsaw reviews. It has an automatic oiler. It suits a wide range of homeowners. It’s easy to start with a push button. It doesn’t come with the battery and charger. These have to be purchased separately. You are limited with where you can take it because you need to be near a power source for the battery. 12 inch bar and chain. Dimensions: 26.4 x 8.1 x 11 inches. QWhat kind of chain does it have? A12-inch steel bar and chain, 3/8-inch chain pitch. QWhat battery and charger does it need? AG-MAX 40V Li-Ion battery and charger. QDoes it come with the battery and charger? QHow long does the battery last for? Aside from not coming with a battery or charger, this chainsaw represents great value for money. It’s affordable to buy both the tool and the battery and charger as well. All replacement parts are also available online and in store at a low cost. It’s easy to start, easy to use, and easy to maintain. Everything about this 12 inch chainsaw for homeowners is ‘easy’. It can also be maintained in mere minutes by just refilling the chain oil and giving the casing a quick clean. Check out what other people who purchased this product think about it. Read GreenWorks 20292 cordless electric chainsaw reviews. It’s perfect for homeowners who just need to trim small branches and limbs. It comes with a 2aH battery and charger. It starts at the push of a button. You can’t stray too far from a power source. It’s limited to very light duties around home. It can only complete about 35 small cuts before running flat. 10 inch bar and chain. 24V lithium-ion battery and charger. Dimensions: 12 x 8.07 x 24.8 inches. QWhat battery does it take? QWhat batteries can be used in this saw? 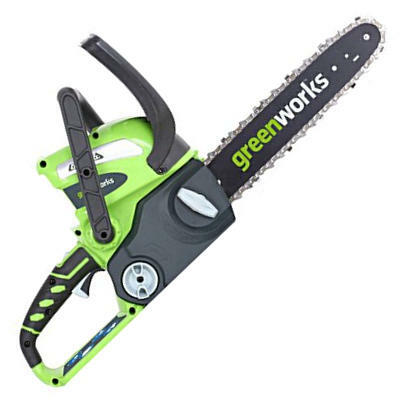 For the aging homeowner, or those with minimal maintenance required, this GreenWorks chainsaw fits the bill. It has a small, 10 inch chain, and runs extremely well. What it lacks in power, it makes up for in accuracy and exceptional features. It can cut up to 35 small limbs and it’s reliable with minimal maintenance. It also starts with ease and is the perfect addition to a garden shed. Check out what other people who purchased this product think about it. Read GreenWorks 20362 cordless electric chainsaw reviews. Its battery can be used with over 25 other GreenWorks power tools. It’s up to 10x less noisy than a gas chainsaw. It has less vibration than a gas saw. You can’t take it far from a power source. It’s limited to small domestic cutting jobs. The chain can sometimes fall off without warning. Dimensions: 9 x 12.5 x 14.5 inches. QDoes it come with a battery? QIs it a top handle or rear handle saw? QDoes it have an automatic oiler? This top rated chainsaw puts petrol powered chainsaws to shame. Even though it’s suited towards homeowners with just a 12 inch bar and chain, it packs a real punch in power. It can cut with ease, and has decent battery life to get a lot completed in a small time frame. It also starts at the push of a button, is cost effective and easy to maintain, and is very affordable to purchase. It’s affordable to purchase and can undertaYou can find this model for sale both online and in hardware and retail stores. It’s one of the best deals on the market because it suits such a wide audience at such a low cost. Check out what other people who purchased this product think about it. Read GreenWorks 2000219 cordless electric chainsaw reviews. It has a grunty 14.5 amp motor. It offers tool-less chain tensioning. The wrap around handle gives the user flexibility when cutting. You have to use it near a power source. Users note poor sprocket design which causes the chain to fall off. Dimensions: 8.5 x 10.25 x 33 inches. QDoes it come fully assembled? QWhat extension cord should be used? QDoes it have a brushless motor like other models? If you want the grunt of a gas powered saw without the muck, grease and grime, this is the chainsaw for you. 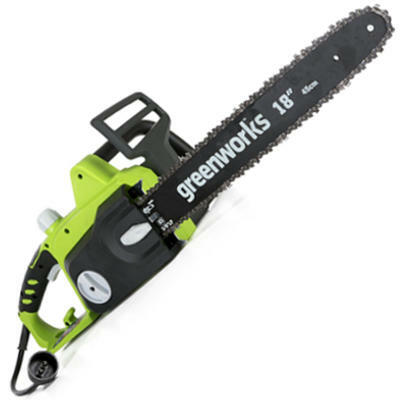 This is undoubtedly one of the best GreenWorks chainsaws for the money. It’s affordable to purchase and can undertake large domestic cutting duties with ease. It’s top rated on the market and reviews have spoke highly of its abilities. It’s reliable and also requires minimal maintenance. Simply fill the chain oil reservoir, sharpen the chain and push the start button. It’s as simple as that! Check out what other people who purchased this product think about it. Read GreenWorks 20332 corded electric chainsaw reviews. You can get optimum reach with the 3-piece aluminum 8 foot pole. It comes with a quality G-MAX 40V Li-Ion battery and charger. Some of the metal isn’t good quality. The chain tension adjustment screw is in an awkward spot. 8 inch bar and chain. Dimensions: 107 x 7 x 7.5 inches. AUp to 50 cuts on one charge. QDoes it come with the battery? QHow long does the battery take to charge? For the price, you can expect a top rated, affordable pole saw which is sure to be an arborist’s best friend. It runs very well, is lightweight, low maintenance and has decent battery power. You can also keep both feet on the ground and still reach those top branches with the 3-piece aluminium extendable pole. When you’re looking for a quality pole chainsaw that ticks all the boxes, opt for a GreenWorks! Check out what other people who purchased this product think about it. 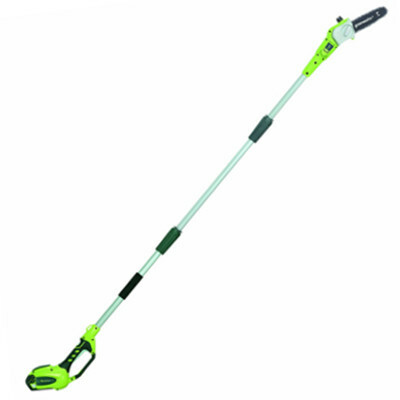 Read GreenWorks 20672 electric pole chainsaw reviews. It can be difficult to transport or store your chainsaw when you don’t have appropriate packaging. It’s all well and good to try wrap it up well, or place it in a cardboard box, but both can still allow damage to the body or the bar and chain. That is why GreenWorks has a quality case on the market designed to reduce unnecessary wear and tear.The case is a black protective hard case designed for the GreenWorks 80V chainsaw. It fits the chainsaw well, without the need for extra packing inside, or outside the case. If you are looking specifically for GreenWorks case, check out this comprehensive guide about available GreenWorks chainsaw cases. However, if you’re looking for a case in general regardless of the brand, you would love to read this full buying guide on how to select the best chainsaw case for the money including reviews & comparison. If you are looking specifically for GreenWorks boots, check out this comprehensive guide about available GreenWorks chainsaw boots. However, if you’re looking for boots in general regardless of the brand, you would love to read this full buying guide on how to select the best chainsaw boots for the money including reviews & comparison. Not only do GreenWorks produce quality electric power tools and equipment, but they also manufacturer many replacement parts for those tools. Every now and again a chainsaw may require a replacement bar. Or maybe you would like to keep one as a spare in case of damage. 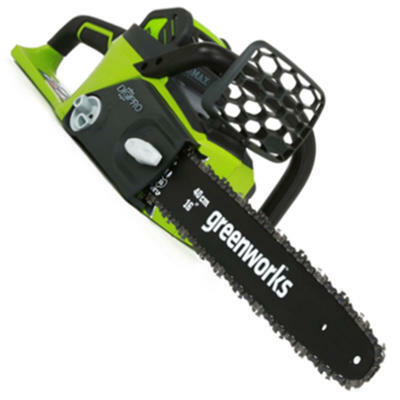 Whatever the case, GreenWorks offer many different sizes to fit their extensive range of chainsaws. All are constructed of quality steel. You simply need to know your model number and accurately match it against the bar. The bars can be purchased both online on websites such as Amazon, and in many stores. If you are looking specifically for GreenWorks bar, check out this comprehensive guide about available GreenWorks chainsaw bars. However, if you’re looking for a bar in general regardless of the brand, you would love to read this full buying guide on how to select the best chainsaw bar for the money including reviews & comparison. When a chain is well maintained it can last a long time. However, if it is damaged, or you have sharpened it until it has reached 4mm, it’s time for a replacement. It’s always handy to keep one or more chains handy around the garage in case of unforeseen breakages. You can purchase a range of quality steel GreenWorks chainsaw chains both online on websites such as Amazon, and in many physical stores. The chains are built to stand the test of time, and just need regular lubrication to keep them performing at their best. If you are looking specifically for GreenWorks chain, check out this comprehensive guide about available GreenWorks chainsaw chains. However, if you’re looking for a chain in general regardless of the brand, you would love to read this full buying guide on how to select the best chainsaw chain for the money including reviews & comparison. GreenWorks is made by manufacturer Globe Tools Group. Where are GreenWorks chainsaws made? 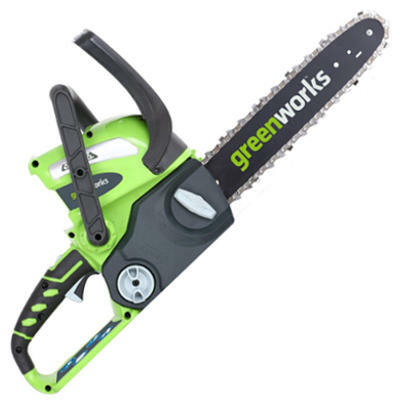 Where do you buy GreenWorks chainsaws? They can be found online on websites such as Amazon, or in stores such as Walmart and Home Depot.